Duncan - The Drinking Bird | Keep a full glass in front of the bird and he will drink all day! Duncan the Drinking Bird is a fun desktop companion and classic novelty item. Fill a glass with cold water and submerge his head in the water getting it completely wet. Place Duncan near the glass and he will continue to bob and dunk his head into the glass all day long! It appears to be magic... But it's actually the principles of thermodynamics in action! Keep a full glass in front of him and he will drink all day! 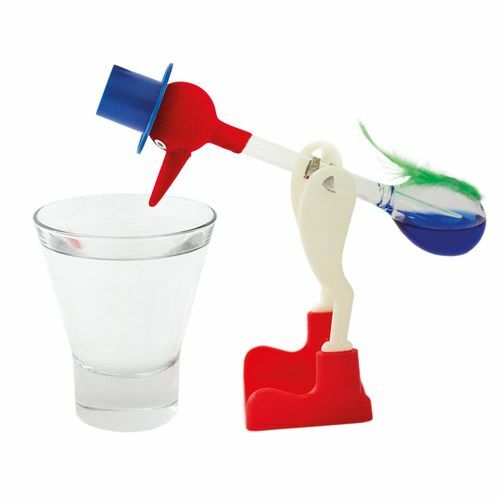 Duncan - The Drinking Bird provides hours of fun and a trip down memory lane when the wonders of science left us in awe! It's exactly what I wanted. Reminds me of the ones we used to have when I was younger. Will definitely buy from you again . Very happy .